Jane Williams is the happiest woman in New York. She has a dream job, a perfect Manhattan apartment, and a man she wants to marry. Her whole life is mapped out to the finest detail, and things just can’t get any better. But in a New York minute, everything changes. After an evening on the town with a hot Hollywood actor her PR firm is wooing, she wakes up to a day filled with strange occurrences—a weird mark on her face and a red-haired woman who seems to be following her every move. This bizarre day turns increasingly horrible, and over the course of it, Jane loses her boyfriend, her best friend, her job, her home, maybe even her dog. Unsure of why she’s being tested, Jane struggles to hold herself together while her world falls apart. Has God forgotten her? It’s a bit hard finding good Christian fiction in the Philippines because truth be told, not many bookstores carry it. Sure, there’s OMF Literature, but the last time I saw Christian fiction on their shelves that isn’t by Frank Peretti (not that I mind, except that I have a lot of Peretti’s already) or Ted Dekker was almost four years ago. I’m glad that I can find some good YA Christian fiction in Fully Booked, but as for chick lit or non-suspense Christian fiction…well, it’s hard. That’s why I result to getting books online instead, because there’s a bigger selection of them there, obviously. So yes, I ordered this online, and I got it from a sale, which is even more awesome. I’m a fan of Anne and May’s Miracle Girls series (which I will review as a whole once I get the last book in the series, which I hope gets to Fully Booked soon! ), but I’ve always been curious about their previous books. When I heard that The Book of Jane was included in Chicklit Club’s Ultimate 100 Chicklit Collection, I decided to put it in my Amazon purchases before my dad went home. Enough of the story on how I got the book, and let’s get to the actual book. 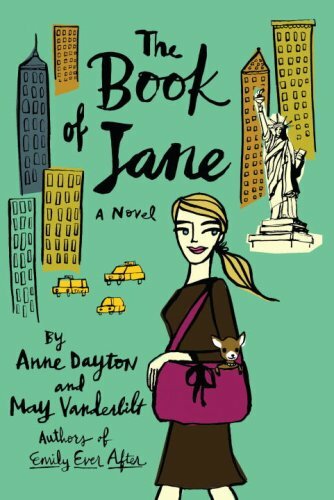 The Book of Jane is a retelling of the story of Job, told in a woman’s perspective and in New York City. We all know the story of Job, right? It’s about a man who’s been blessed by God all his life, and then God allows the devil to wreak havoc in his life (provided he doesn’t harm Job) so they could see if Job would still be faithful to God even if he gets all these misfortunes (I mean come on, his entire family dying? Getting boils all over his body? I experienced the flood and it’s enough to drive me nuts — to experience all that might drive me over the edge). It’s about Jane Williams, who has the perfect apartment, perfect job, perfect friends, perfect boyfriend and perfect family…until everything turns out to be not perfect, and she’s left scrambling for meaning and her faith. I liked the novel, although I think the similarities to Job ended right there. Okay, I admit to not having read the entire book of Job yet so I can’t make perfect comparisons, but I do know that the book of Job had all these poems about Job’s friends who talk to him about his misfortunes and his faith. Jane seemed alone during her low points, except when she met up with Coates, but for the rest of the time, she had friends and she had things to remind her of her fortune despite the things that happened to her. But the story is quite delightful, and it touches a lot of subjects — faith (obviously), relationships, friendships and even death. I loved Jane’s friend Lee, although I kind of had a feeling he was in the closet. I don’t know, he just had that vibe? I figured who Coates would be in Jane’s life early enough, but their relationship was kind of nice to see that there was more to Coates’ arrogant exterior.